Question: Should I bathe my cat? Answer: There isn't much need to bathe a cat. They often will keep themselves clean and tidy, but occasionally they may need help with grooming by brushing them, especially if longhaired (longhaired cats should be brushed daily). Bathing can strip the coat of essential oils which are needed to promote skin health and add a layer of waterproofing. Also if you are using topical flea control products, you might risk removing these during bathing. Question: Why does my cat scratch the floor around her bowl after she's finished eating? Answer: Cats can do this as a way of disguising what they view as 'uneaten prey'. In the wild, any uneaten food could draw the attention of bigger predators or other cats that could pose a threat, so cats may feel this instinct kicking in and want to hide uneaten food. Question: My cat has a hanging ‘pouch’ of very loose skin under her belly, in front of her hind legs. I read that it's normal, especially in spayed cats, and more pronounced as they get older, but wanted to make sure before I take her to the vet for nothing (very stressful for her!). Answer: Many cats develop a ‘dewlap’ – a hanging apron of skin on their belly. It is a place for fat storage and is a normal feature. As you describe it, I'd say this was nothing to worry about but keep an eye on her weight, especially as she gets older and less active. Question: What is the best way to reduce the risk of gingivitis and plaque build-up? We adopted our cat as a stray when she was around three years old and she had many teeth removed due to plaque. We still have her and her two daughters, and at the most recent vets appointment, they said they had gingivitis, and if it got worse they would put her on antibiotics. What would you suggest is the best way to help with this? To me, 'just waiting' until she needs antibiotics certainly does not solve the problem! I must also add that we regularly give them Dental Bites and have been putting some plaque prevention stuff in her food once a day to see if it helps. Answer: Your little stray is lucky to have found you! 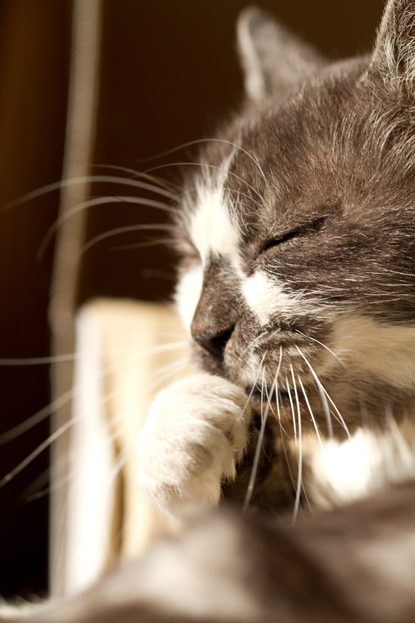 There are a number of things you can do to help keep your cat's teeth healthy. Brushing teeth daily with a toothpaste specifically designed for cats will help to reduce the build of plaque and tartar and help to keep the gums healthy. There is a variety of toothbrushes to choose from, finger brushes, microfibre clothes for your finger through to full length pet toothbrushes. There are specific dental diets designed with bigger kibble available from your vets to help clean teeth, along with solutions and natural supplements to add to your cat's food and water which may help prevent dental disease. Although I find that the stuff added to water doesn't always work to well and it can put some cats off from drinking enough water. I'd recommend speaking to your vet for more information and you may find our Teeth and oral health leaflet useful. Would you like to ask one of Cats Protection's feline experts a question about your cat? Don't miss the next live Facebook Q&A sessions: chat with Behaviour Manager Nicky Trevorrow on 17 November; or vet Dr Sarah Elliot on 26 January. All Q&As are held on Cats Protection's national Facebook page from 2-3pm. See you there! Is there a proper reason to why cats don't like water? please answer when you can. And as for the already existing answers they are very useful for cay owners!